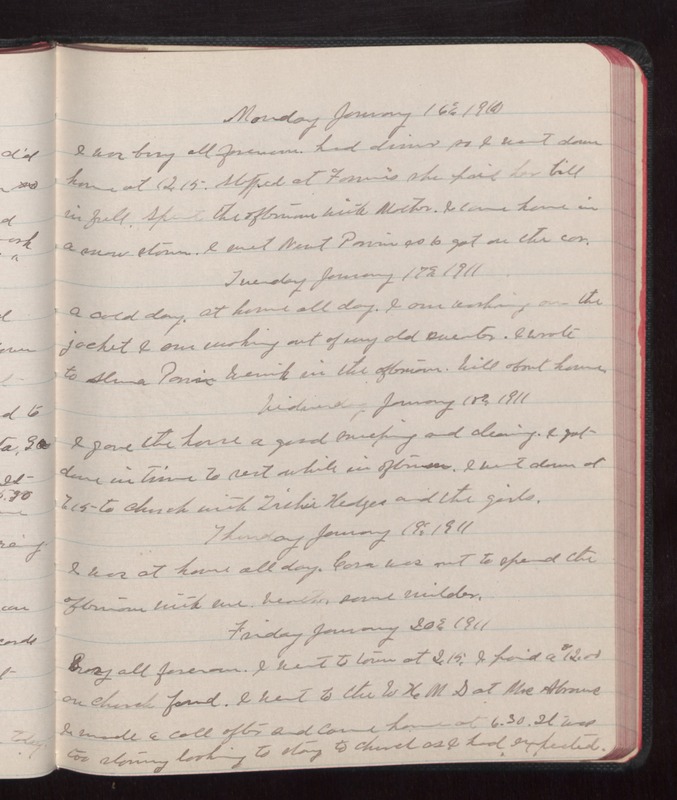 Monday January 16 1910 I was busy all forenoon had dinner so I went down home at 12.15. Stopped at Fannies she paid her bill in full. Spent the afternoon with Mother. I came home in a snow storm. I met [Newt? Parris?] as I got on the car. Tuesday January 17 1911 A cold day. at home all day. I am working on the jacket I am making out of my old sweater. I wrote to [Alana Parris?] [illegible] in the afternoon. Will about house. Wednesday January 18 1911 I gave the house a good sweeping and cleaning. I got done in time to rest while in afternoon. I went down at 7.15 to church with Trishie Hedges and the girls. Thursday January 19 1911 I was at home all day. Cora was out to spend the afternoon with me. Weather some milder. Friday January 20 1911 Busy all forenoon. I went to town at 2.15. I paid a $12.00 on church fund. I went to the W H M S at Mrs. Abrams I made a call after and cam home at 6.30. It was too stormy looking to stay at church as I had expected.